How many pictures of you exist on Facebook? If you’re friends are anything near as snap happy as mine I’m guessing the answer will be a lot, and equally the amount you studiously detag (ugly makeup/ obvious VPL/ double chin) will be high. Once detagged you thought that was the end of it, but not anymore! 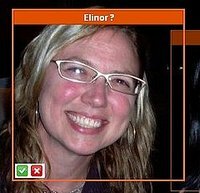 There’s a new application you can add to your profile called PhotoFinder which uses facial recognition software to scan through your photos and all public photos, and will suggest tags you can add. The app won’t tag photos within the site, only in the app, so you’d need to be registered to view all the newly tagged pics. Secondly the settings work in harmony with your Facebook settings, so if you’re a very private person people won’t be able to view your images. Problem is when actual close friends find you, as they’ll then be able to tag the photos you’d rather they hadn’t seen. You do get sent an email notification though so it’s not totally bad news, you just might want to think of actually removing offending images rather than just detagging them from now on.